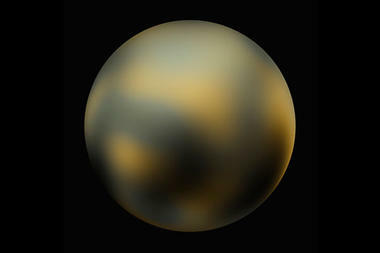 WASHINGTON, Feb. 5, 2010 /Photography News/ NASA has released the most detailed and dramatic images ever taken of the distant dwarf planet Pluto. The images from NASA's Hubble Space Telescope show an icy, mottled, dark molasses-colored world undergoing seasonal surface color and brightness changes. Pluto has become significantly redder, while its illuminated northern hemisphere is getting brighter. These changes are most likely consequences of surface ice melting on the sunlit pole and then refreezing on the other pole, as the dwarf planet heads into the next phase of its 248-year-long seasonal cycle. Analysis shows the dramatic change in color took place from 2000 to 2002. The Hubble pictures confirm Pluto is a dynamic world that undergoes dramatic atmospheric changes not simply a ball of ice and rock. These dynamic seasonal changes are as much propelled by the planet's 248-year elliptical orbit as by its axial tilt. Pluto is unlike Earth, where the planet's tilt alone drives seasons. Pluto's seasons are asymmetric because of its elliptical orbit. Spring transitions to polar summer quickly in the northern hemisphere, because Pluto is moving faster along its orbit when it is closer to the sun. Ground-based observations, taken in 1988 and 2002 show the mass of the atmosphere doubled during that time. This may be because of warming and melting nitrogen ice. The new Hubble images are giving astronomers essential clues about the seasons on Pluto and the fate of its atmosphere. When the Hubble pictures taken in 1994 are compared to those of 2002 and 2003, astronomers see evidence that the northern polar region has gotten brighter, while the southern hemisphere darkened. These changes hint at very complex processes affecting the visible surface. The images will help planetary astronomers interpret more than three decades of Pluto observations from other telescopes. "The Hubble observations are the key to tying together these other diverse constraints on Pluto and showing how it all makes sense by providing a context based on weather and seasonal changes, which opens other new lines of investigation," says principal investigator Marc Buie of the Southwest Research Institute in Boulder, Colo. These Hubble images, taken by the Advanced Camera for Surveys, will remain the sharpest view of Pluto until NASA's New Horizons probe is within six months of its flyby during 2015. The Hubble images are invaluable for picking the planet's most interesting hemisphere for imaging by the New Horizons probe. New Horizons will pass by Pluto so quickly that only one hemisphere will be photographed in detail. Particularly noticeable in the Hubble images is a bright spot that has been independently noted to be unusually rich in carbon monoxide frost. It is a prime target for New Horizons. "Everybody is puzzled by this feature," Buie said. New Horizons will get an excellent look at the boundary between this bright feature and a nearby region covered in pitch-black surface material. "The Hubble images also will help New Horizons scientists better calculate the exposure time for each Pluto snapshot which is important for taking the most detailed pictures possible," Buie said. With no chance for re-exposures, accurate models for the surface of Pluto are essential for properly exposed images. The Hubble images surface variations a few hundred miles across that are too coarse for understanding surface geology. But in terms of surface color and brightness, Hubble reveals a complex-looking world with white, dark-orange and charcoal-black terrain. The overall color is believed to be a result of ultraviolet radiation from the distant sun breaking up methane present on Pluto's surface, leaving behind a dark and red-carbon-rich residue. The Hubble images are a few pixels wide. Through a technique called dithering, multiple, slightly offset pictures are combined through computer-image processing to synthesize a higher-resolution view than can be seen in a single exposure. "This has taken four years and 20 computers operating continuously and simultaneously to accomplish," Buie said. Buie developed the special algorithms to sharpen the Hubble data. He plans to use Hubble's new Wide Field Camera 3 to make additional observations prior to the arrival of New Horizons.